Where the hell have I been? After months of job- and apartment-searching, I’m thrilled to finally have an answer for you. Zelda and I moved into our new apartment in Chinatown, New York on Tuesday. It’s just a ten minute walk from my new job at Osswald Parfumerie, which I begin today! Since I pretty much live in Perfume Mecca now (my apartment is within ten minutes walking distance of the second-largest Sephora in Manhattan, MiN New York, a Le Labo boutique, <em>the</em> Atelier Cologne boutique, and a Duane Reade that carries THE ENTIRE DEMETER RANGE), this seems like the perfect time to resume daily perfume blogging! Thank you so much for your patience during these past few months, and welcome back! Woo hoo! Congratulations! Next time I’m in NY I’ll have to stop in at Osswald and visit you. Will you be working with Nik? He’s the best. Enjoy your adventures in NYC. Congratulations, Ari, on both the job and the apartment! So glad you’ve been able to land a job that meshes your degree and personal interests–should make for a much more enjoyable work environment. Happy adventures to you and Zelda! Good one Arielle! I’m so happy for you. Everything is crossed for you. Health, Wealth and Happiness. New York? Manhattan! Oh my God, Girl! Congrats on your job at Osswalds! I’m sure everyone will be happy with your help in chosing their perfumes. Congratulations you do indeed live in perfume heaven!!!! Dying of envy and Look forward to hearing all about it! Wow, that is thrilling news! Can’t think of a more perfect dream job for a perfumista. And I’m so happy to hear that you now live that much closer to me, and that I can stop in at Osswald to see you. Will you be attending Sniffapalooza? Yay! Congrats on the new job and new apartment! Sounds like you’re in ‘fume-fiend heaven. Congrats! What an amazing adventure is unfolding for you! You go, Girl! How very exciting for you (and Zelda)! Congratulations on finding a job in the perfume field and finding what sounds like a great location to live. Sounds like this next phase of your life is set to be wonderful (and well-deserved). Look forward to more of your wring, whether on perfume or life in New York. Wow! I am so jealous of your job at Osswald! I will definitely let you know the next time I plan to visit. I am sure you will learn so much working with Clement he is a walking encyclopedia of fragrance knowledge. Best of luck with everything, I can’t wait to hear more about it! Best of luck to you on your new job and your new apartment! Congratulations! I’m so glad that you found an apartment and a job. I begin internship hunting soon, so I know how stressful that can be. Have a blast in NY! Ari, this is just the beginning of a great adventure!!! Congratulations on all your hard work! I hope Osswald knows how lucky they are to have you! Good luck and keep in touch!!! Congratulations on all the changes in your (and Zelda’s) life and welcome back! Yay! Congratulations on … everything! Hope to meet you at Osswalds one day as it is only a subway ride away for me on a weekday. 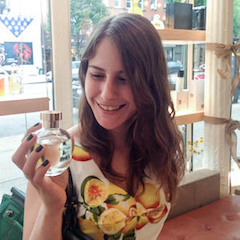 And about the Duane Reade and the full line of Demeter perfumes – awesome! It seems like you live and work in perfume fairyland!! Good luck and best wishes in your new apartment and at your new job!! Congratulations! As you can see, I’m green with envy. Start spreading the news…Ari is at Osswald!! Congrats on New York, new apartment, and new job!! Welcome the the Big Apple, Ari, and congratualtions on your new job!! I’m very excited for you. I’ll come see you at Osswalds. Wow, congratulations Ari, you have landed the perfect job. Hugs to you and Zelda.